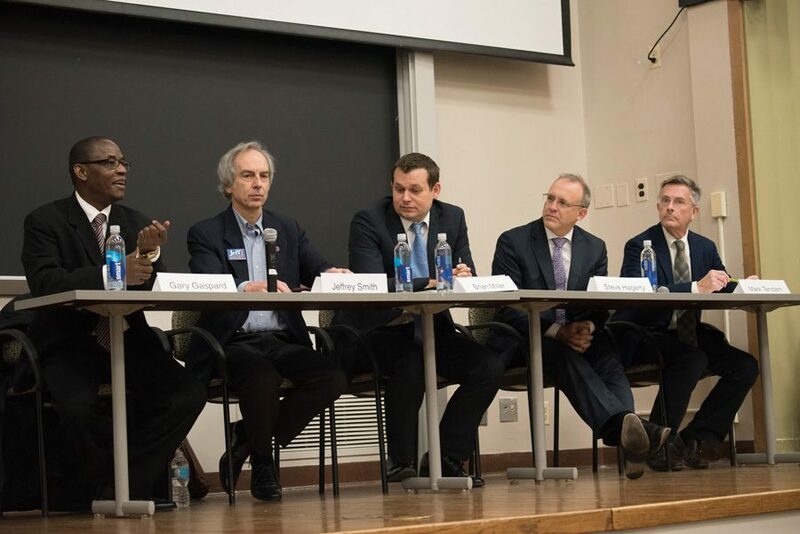 Candidates for mayor speak at a debate. Ald. Mark Tendam (6th) (far right) and businessman Steve Hagerty (second from the right) were the top two candidates in Tuesday’s primary, and will move on to the general election in April. Businessman Steve Hagerty topped the field in the mayoral primary, followed by Ald. Mark Tendam (6th). The two candidates will move on to the general election held on April 4. Hagerty won over 44 percent of the vote, with Tendam earning over 20 percent. Ald. Brian Miller (9th) followed closely behind with nearly 19 percent. Lawyer Jeff Smith (Weinberg ’77) won nearly 13 percent of the vote and former Evanston Township supervisor Gary Gaspard earned over 3 percent, according to election results on the Cook County Clerk’s website. Only 168 votes separated Tendam and Miller. Almost 10,000 Evanston residents cast votes on Tuesday, less than the 10,375 votes counted in the mayoral general election in 2009, the most recent contested race for the position. Hagerty, who runs an emergency consulting business, has pledged to continue the work done by Tisdahl if he is elected. This includes work on youth employment to limit violence, encouraging economic development and strengthening the Affordable Housing Fund. Tendam has been on the council since first being elected in 2009. Tendam told the Daily in early February he would prioritize job creation and affordable housing, focusing particularly on those who are homeless or struggle with mental health issues or substance abuse if elected. During the campaign, Hagerty earned the endorsement of Mayor Elizabeth Tisdahl, former Mayor Lorraine Morton and retiring Ald. Delores Holmes (5th). Hagerty also narrowly earned more votes in the Democratic Party of Evanston’s poll of its members than any other candidate. Tisdahl said Tuesday evening Evanston voters were “wise” to choose Hagerty and Tendam as the top two candidates. “They will campaign in a positive manner, and that they are two very good and decent people,” she said. The primary followed an unusually contentious campaign season that began with confusion over candidate filing dates in November. That boiled over to several Electoral Board hearings on objections filed by Smith and a supporter of Miller to the other candidates nominating petitions. Despite the objections, all five candidates stayed on the ballot for the primary. Had a candidate won more than 51 percent of the vote Tuesday, they would have been declared the winner. Tendam said Tuesday evening the primary was the first “hurdle” they had passed. He said he was “anxious” to begin campaigning for the general election. Tendam said he was pleased with the turnout, a sentiment not shared by Jeff Smith, who said he expected the results to turn out differently. Still, Smith said he was proud of what his campaign had put together in a “tough” multi-candidate primary. Gary Gaspard said he was willing to work with the next mayor, and that he respected both Tendam and Hagerty. Miller said Tuesday evening he was “disappointed” in Tuesday’s results. For his part, Hagerty said Tendam was a “formidable” competitor. “The results tonight indicate that people have a heightened interest in local government and making sure they have leaders in their local government who can help them solve the big problems that are ahead,” he said. A previous version of this story misstated the number of voters who cast their ballot in the mayoral primary. Less people voted on Tuesday than in the 2009 general mayoral general election. The Daily regrets the error.